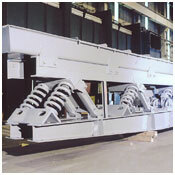 Vibrating conveyor unit widths from 6 inches to 10 feet, and lengths up to 400 feet. Light/medium duty vibrating conveyor units feature leaf spring construction for low headroom applications. Heavy-duty vibrating conveyor designs feature rugged coil spring construction with rocker arm stabilizers. Gentle handling of fragile products. 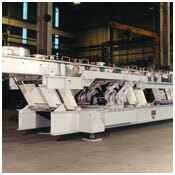 High temperature conveyors available for handling materials up to 2000 deg. F.
Continuous structural steel base along length of conveyor. Few moving parts, easy cleanable surfaces, minimum maintenance. Balanced/isolated units allow mounting in upper structure due to reduced reactions. Polished trough and special coatings available for sticky products. Easily replaceable liners and wear surfaces available. Easy to clean, sanitary, 3A dairy designs available, CIP systems available. Dust-tight construction for safety and comfort available. Manual or automatic bypass gates available. Quiet operation, low operating costs, energy efficient. 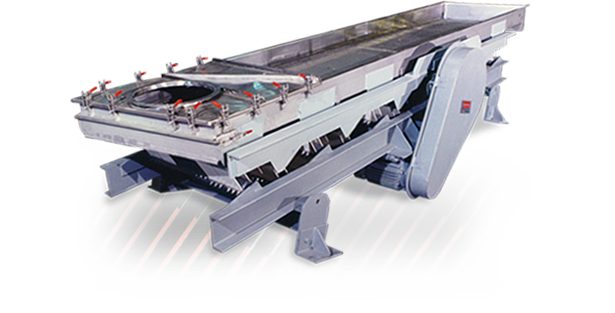 For more information on Carrier vibrating conveyors, refer to brochure #16907. 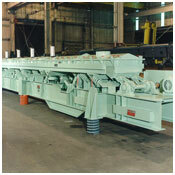 For foundry vibrating conveyors, refer to brochure #16615.